We recently had the opportunity to experience Gutai: Splendid Playground, an exhibition currently on view at the Guggenheim. The show highlights the varied visionary practices of a collective of avant-garde Japanese artists called Gutai, lead by Yoshihara Jirō from 1952 to 1972. The exhibition is one of the first in-depth engagements with this important group staged in the United States. After World War II, the Gutai artists turned away from making work that expressed human-centered stories. Instead of focusing on translating what humans thought and felt, they instead put energy into focusing on material in and of itself. It was time to pay more direct attention to paint as a substance, rocks as things, light as material, mud as texture and flow. Matter itself needed to be “heard,” felt, moved with, passed through and more directly experienced. Materials needed to be freed from being mere conduits for human stories and, instead, recognized as forces unto themselves. These realizations are likely an indecipherable combination of Japanese cultural tendencies to be aware of materiality in general. Such tendencies far pre-dated the War, but were likely compounded by experiences of being being deeply affected by the material impact and imprint of the atomic bomb (the “force of things,” at its most forceful). 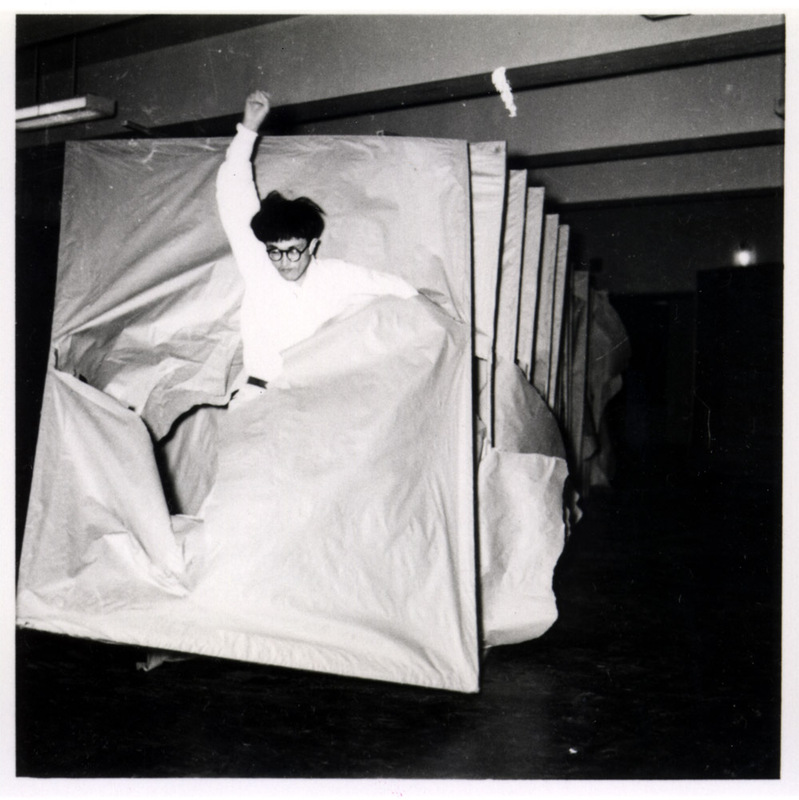 To us, the Gutai aspirations have the ring of recent writings on the topic of vibrant materialism, along with other materialist philosophies now (re)gathering momentum in academe and art criticism. It’s worth noting that Japanese artists were exploring the notion that matter “tells a story and even cries out” and were having extended conversations about ways to “serve matter”—in the 195os. Many Westerners are just now getting our first in-depth engagement with material practices that engage these ideas. The effects of this lag are significant. It couldn’t be happening at a better time. We have arrived at a moment (some call it the Anthropocene event) when much is at stake as a result of how we will relate to the material world from here. A lack of deeply cultivated or collectively operationalized awarenesses of the extent to which we are of and from the earth’s matter has most likely contributed to bringing us to this point. Now that we (Western-enculturated people) are finally opening up to the idea that the materials around us can impart important information and instructive sensations to us that we otherwise cannot know, our species might have a shot at a chance of navigating its uncertain futures. Gutai’s particular take on vibrant materialism feels like a vital but missing piece of the discussions currently circulating about how the Anthropocene is taking shape. Many of those conversations refer back to or presume human-centered perspectives and scenarios. The Gutai collective looked to matter itself as a source of instruction about how to move and act in the world. What if, as artists today, we addressed matter as being able to communicate material realities and forces that are in the midst of emerging on the planet right now? What if we made this mode of address the hinge of our “art”? Perhaps it is time (once again) to deemphasize the “Anthro” in the word Anthropocene and instead initiate (over)due gestures-toward the potency and play of planetary materialities in and of themselves, while still acknowledging their inextricable connectedness with human bodies and assemblages. We sense that it is time to enact an updated “frame” for our work at smudge studio. This act of re-framing is perhaps more vital than any single new project. For the next five years, our points of departure and sources of creative inspiration will be events of planetary change now being called the Anthropocene. The focused duration of this frame signals our sense that during the next five years, humans will grasp the speed, scale, and material realities of planetary change events more concretely. Arguably, thoughts, dreams, actions and creative gestures that we humans make in response to our first inklings and shared experiences of Anthropocene events will set the stage for their potential consequences. Yet, there is more to this frame than the human world. Anthropocene materiality “knows” something of great import to us humans about our planetary situation. We will realize this by paying attention to what the atmosphere, the glacier, the rock strata, the water table “do” in response to contemporary forces at play. As we develop this frame as process, we will seek out sites and time where change events of the Anthropocene are unfolding with particular intensity, palpability and exquisiteness. We will use the immediacy of new digital media to slow down, pay deep attention, move-with, and make-from-within events and forces of change itself. We wager that a lively alter-world will catch us and gesture back. Much of what we need for this project will be learned and invented along the way. We envision creating dynamic tracings of the Anthropocene’s arrival into widespread human + nonhuman cognizance. Works that result from next five years may take the form of multi-media dispatches. We step off with the intention to compose a collaborative, alter-human voice with multiple, moving points of view—while we live and make in the midst of the alter-beginning that is the next five years. I love this statement. The interesting thing here is that the act of your “making” or “tracing” brings back in the “Anthro”, but imbues it with new meaning.